Getting a barbed wire tattoo is a great way to express your strength, that you've overcome adversity or a particularly hard experience, or your religious faith. Though perhaps primarily thought of as a popular tattoo for men, barbed wire tattoos are now often chosen by women as well. The variety of meanings, particularly when paired with another image or symbol, as well as the potential for individuality and personal design, make barbed wire tattoos a great choice for almost anyone. There are several different variations of barbed wire tattoos: you may choose to get the barbed wire on its own, or you may pair it with another symbol, thus added another layer of meaning to the tattoo. Below are several variations of the barbed wire tattoo. Sometimes, the most effective tattoo is the simplest. For many, barbed wire represents the crown of thorns worn by Jesus as he struggled with the cross on his journey towards crucifixion. Having a band of barbed wire around the bicep or wrist can thus be a daily reminder of your faith, and how Jesus suffered and died for humanity. 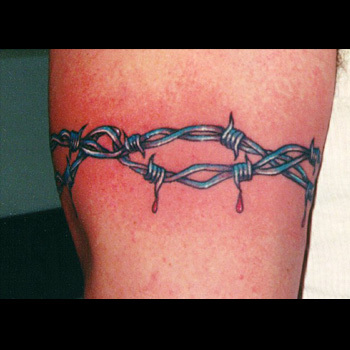 Another, somewhat darker, meaning of the plain barbed wire tattoo is related to a person's time in prison. Barbed wire is a symbol of captivity, and by getting a barbed wire tattoo you can communicate to others that you have spent time behind bars, perhaps unjustly so. The number of spikes on the barbed wire can indicate how many years you spent in prison, so consider personalizing the tattoo in this way to make it more unique and meaningful to you. Historically, the barbed wire tattoo can also allude to World War II and the prisoners of war from that conflict. This meaning is still relevant to today's conflicts, as many soldiers (former and current) may opt for a barbed wire tattoo to represent time spent behind enemy lines. In terms of placement, consider getting this tattoo around the bicep to represent strength in overcoming the adversity faced while involved in combat. Though plain barbed wire can be a clear indication of your Christian faith, make that allusion all the more meaningful by placing the barbed wire around a cross. This will signify that your tattoo is representative of Jesus' suffering on the cross and his salvation of mankind through both the crown of thorns symbolism in the barbed wire and the cross as a symbol of the crucifixion. You may want to personalize this tattoo by getting a meaningful psalm of other bible verse tattooed underneath, either the entire phrase or an indication of where it is in the bible (ie: Psalm 23:12). Combining barbed wire and a heart is a great design for anyone who feels trapped by love. Here, the barbed wire serves as a symbol of imprisonment, and you may want to show it as wrapped tightly around the heart, cutting off its circulation and thereby suffocating it. This feeling of imprisonment may have resulted from a smothering love, a feeling of being trapped in a marriage or family situation, or the pain of unrequited love. 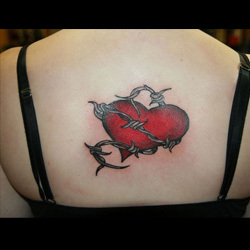 Another variation on this design is to have the wire piercing or slicing through the heart to indicate deeply felt pain. Depicting the heart in such a mode may also be used to indicate the loss of someone close to you: your heart is devastated and your feel unable to cope with their absence. With either variation, consider personalizing it by putting the person's name or birthday underneath the heart on inscribed on the barbed wire. 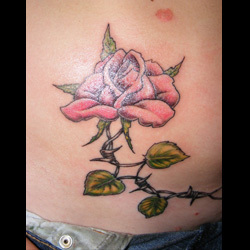 There are a few different ways to incorporate barbed wire into a rose tattoo. The first involves having barbed wire designed as the stem of the rose: the thorns of the rose thus become the barbs of the wire, creating a more potent image of the saying "every rose has its thorn". Following from this well-known phrase, a tattoo of a barbed wire and rose can indicate one's imperfections, or that beneath one's beauty and outer appearances lies a darker, somewhat damaged self. Another variation on this design can indicate a painful love: by having barbed wire encircling the rose in a heart design, you can demonstrate the sometimes hurtful or heart-wrenching emotions and feelings caused by love. One way to personalize these different designs is to play with the color of the rose: while red stands for romantic love, yellow roses signify friendship, and white roses are representative of purity. Perhaps you feel your pure nature was compromised by loving an individual: choosing a white rose would then be a perfect way to capture this meaningful image. 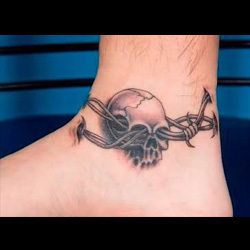 A tattoo of a barbed wire and skull can be representative of a few different things. The skull on its own is often seen as a symbol of death, and having barbed wire encircling a skull can indicate one's fear of death: it may be something that surrounds them, or serve as a reminder that death may always be just around the corner. Barbed wire around a skull may also be a variation on the theme of faith that barbed wire can represent, with the skull representative of Jesus' death and subsequent resurrection. While the skull is most often human in these tattoos, many opt to get an animal skull with barbed wire around it. This tattoo variation can be used to signify one's love of hunting: getting the skull of a deer, rabbit, or other favorite game is a favorite among hunters. Include an inscription of your first hunt or of the date of particularly good catch in order to personalize this tattoo even more! 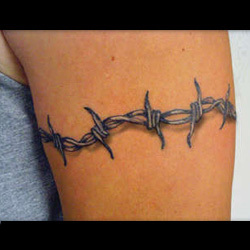 Barbed wire tattoos are popular with men and women alike, with celebrities such as Cheryl Cole, Elizabeth Olsen, and Brian Urlacher all sporting variations of this design. While the wide array of design choices and the inclusion of other symbols are a couple ways to make this tattoo truly unique and your own, the placement of a barbed wire tattoo is another way of personalizing this design. Many people opt for barbed wire around their bicep, but other great placements can include around the thigh, on the wrist and ankle, and along the back if you prefer a larger design. 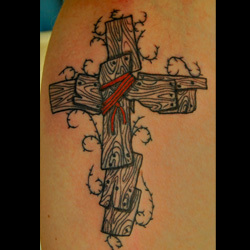 For custom design of a barbed wire, you can check our Custom Tattoo Page.